Please find more information below about our current initiatives, events and other ways to get involved. On this page you can sign up to join us on demonstrations; download campaign materials; invite us to give a talk at your local group or university; and view a list of upcoming events that STWR will host or attend. Article 25 is one of the 30 articles of The Universal Declaration of Human Rights, a milestone document adopted by the United Nations General Assembly in 1948 as a “common standard of achievement for all peoples and all nations”. Still today, millions of people subsist without adequate means for survival. Around 46,000 people die every day from easily preventable and poverty-related causes, while global humanitarian needs have never been higher since the end of the Second World War. Even in the wealthiest nations, we are witnessing a dramatic rise in levels of hunger, deprivation, social exclusion and economic inequality. Yet there is enough food and resources in the world for everyone to enjoy a dignified and fulfilling life, with the basics guaranteed. Just the amount spent on the world’s military exceeds the annual incomes of the poorest half of humanity. A tiny percentage of global GDP could end the scourge of extreme poverty, if every nation cooperated to share the world’s resources under the auspices of the United Nations. This will never happen unless unprecedented numbers of people unite behind a single, overarching demand for governments to implement Article 25 as an effective international law. It will require continuous, peaceful demonstrations on behalf of the least advantaged members of the human family, wherever they may live—both in our countries and far abroad. The time has come to forge a huge united public voice, one that has the potential to reorder global priorities and empower the United Nations to truly represent “we the people” of the world. In the UK, our campaign group Share The World’s Resources (STWR) is participating in demonstrations for economic and social justice by highlighting the cause of Article 25. Please join us by attending national events that relate to the fundamental rights for adequate food, housing, healthcare and social security for all. This might include, for example, anti-austerity marches, calls for diverting military budgets to social needs, demonstrations for the right to housing and universal healthcare, or mobilisations on behalf of free public education, a living wage, decent work, and so on. For those who live in other countries, you can also participate in relevant demonstrations under the banner of Article 25, or organise your own protest activities and awareness-raising events. We are still at the early stages of growing a global movement that upholds the basic rights of every human being to an adequate standard of living—so please get in touch and let us know your plans. Let’s unite and together organise a historic mass movement for Article 25 beyond borders! Read the book for free online, or purchase a copy from our online shop. We are currently running a postcard campaign in the United States with a group of co-workers. The aim is to send a large number of Article 25 postcards - signed by members of the public with a personal message - to progressive individuals and groups who are already talking about social injustice and poverty on the lines of Article 25. This is an ongoing campaign that provides us with a simple method of sparking discussions with people about our vision of unified global demonstrations, from family and friends in our social networks to attendees at relevant events. We also hope that the recipients of the cards – such as Bernie Sanders, Alexandria Ocasio-Cortez and Rev. William Barber (the Poor People's Campaign) – will be prompted by the mailing campaign to directly engage with the cause of heralding Article 25 and sharing the world’s resources. Please contact us to find out more and join the initiative. Please get in touch with us if you are involved in any other events that relate to the cause of Article 25 - for adequate food, housing, healthcare and social security for all - and we will add them to our events page. 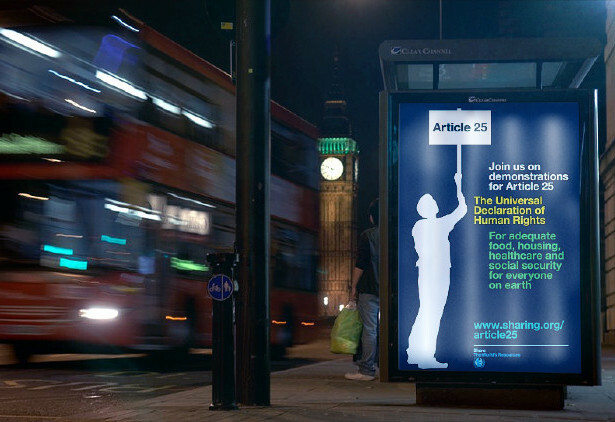 If you would like us to host a talk at your group or university about our campaign for Article 25, please also get in touch.